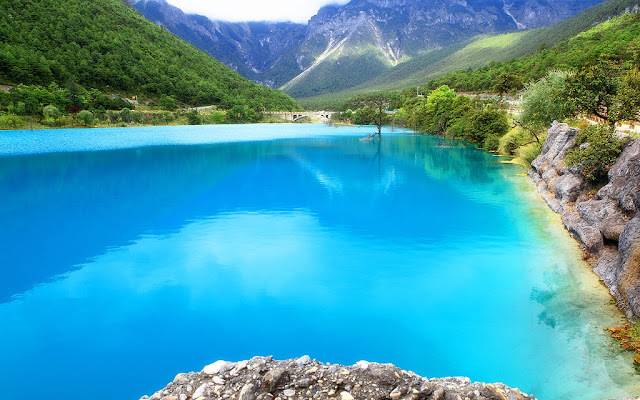 The preexistence of Blue Moon Valley is also known as White Water River is located in Yunnan Province. The water appears blue to us on a bright and clear day, and the valley is framed like a crescent shape. The valley is very beautiful and looks like one blue moon at a distance in its setting of being at the foot of Jade Dragon Snow Mountain hence the name as Blue Moon Valley. The water pool with the mountains around from three sides and water on the rest looks emerald green, contrasting sharply and to each other's advantage with the silk-colored water in the Blue Moon Valley. Blue Moon Valley derives its name from the fact that the mud at the bottom of the lake is white, and the water would change to white color when the rain started. The water of Blue Moon Valley is blocked by the mountains in the process of flowing. Thus it has formed four larger water surface areas, which are dubbed as Yuye Lake, Jingtan Lake, Blue Moon Valley and Tingtao Lake.